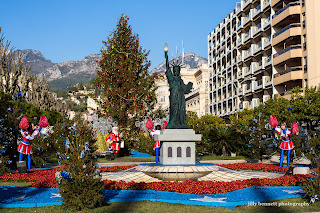 Menton has gone all American for Christmas. The Jardin Bioves features the Statue of Liberty and red, white and blue cheerleaders waving their arms about. Menton est devenu tout Américain pour Noël. Le Jardin Biovès abrite la statue de la Liberté et des pom-pom girls vêtues de rouge de blanc et de bleu agitent leurs bras. What a funny tableau to see in Menton! I love all the bright colors. You've inspired me -- today I will go and take a picture of the Statue of Liberty replica in my my city. 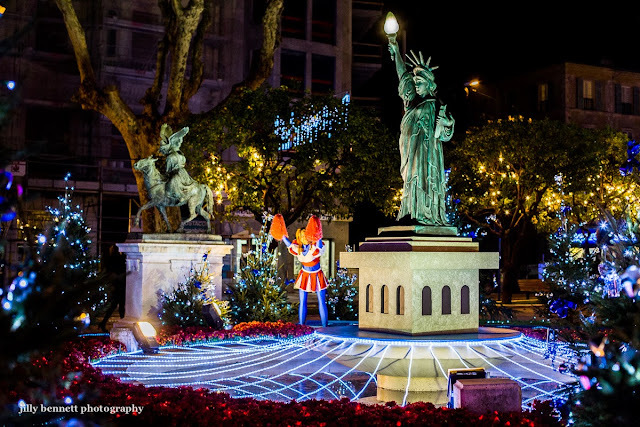 The Statue of Liberty was a gift from France, so it is fitting that it is also celebrated in Menton. Very colorful. France has long been a good friend to the US. It looks fine to me, as long as I can go all French for Christmas.